UKTV, the company behind channels including Dave, Drama and Really, has announced it's launched a new on-demand player for YouView users. The new updated UKTV Play follows an upgrade to the YouView platform, upon which the TV services offered by BT, TalkTalk and Plusnet are based on. Designed to make viewers' experience more enjoyable and personalised, the reimagined VOD player features a new home screen with tailored recommendations and top shows from across the four channels. Collections bring together specially curated themes, and viewers can also collate their favourite episodes to watch later. The all-new predictive search makes finding a programme or collection extra easy. The service boasts a vast and diverse catalogue of shows from UKTV's free-to-view channels, including exclusive UKTV Originals such as Red Dwarf XI and Dara O Briain's Go 8 Bit. 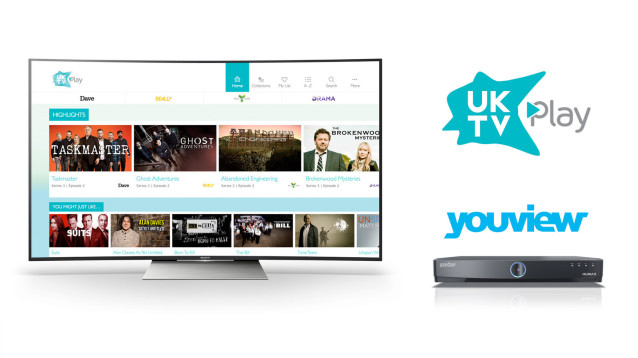 "We're really pleased to bring our new UKTV Play experience to YouView. As with our web, mobile and other set top box apps, viewers now have at-a-glance access to programmes across all the channels, with both hand-picked favourites and personalised recommendations based on what viewers have watched. We hope the new ways of discovering programmes such as predictive search, channel filtering, bookmarking and A-Z list, together with the improved responsiveness, will make the service even more of a pleasure to use." The updated UKTV Play service for YouView coincides with a jump in usage figures for the on-demand player: Since the new app for mobile devices launched in February, views have increased by 38%. When the broadcaster revealed a new UKTVplay.co.uk desktop site last year it contributed to a sharp, 50% increase in views. UKTV Play continues to grow year-on-year. Last week the service had its best seven-day period ever, with total views up 56% vs the year average, helped by new content including UKTV Originals Taskmaster, Alan Davies: As Yet Untitled and Drama's The Brokenwood Mysteries.